This positive slogan badge is 1-inch with a pin back. 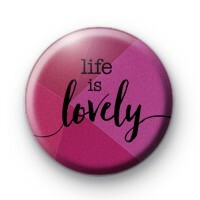 It is different shades of purple with the slogan 'Life is Lovely' written in a pretty script font. Are you trying to radiate positive vibes, or just be a more uplifting person? This would be a lovely badge to pin to your jacket or bag.